An El Cajon woman was hospitalized with serious injuries Thursday after her car was struck head-on by a pickup truck on a two-lane highway in Poway. 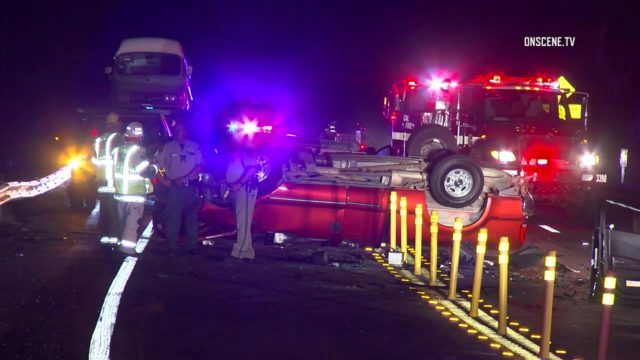 Witnesses told deputies a Ford F-250 crossed the center line on state Route 67 and struck a Hyundai Sonata head-on about 10:20 p.m. Wednesday just south of Cloudy Moon Drive, San Diego County Sheriff‘s Sgt. David Cheever said. The Hyundai’s driver, a 33-year-old El Cajon woman, was taken by Life Flight helicopter to Palomar Medical Center, Cheever said. The 19-year-old Ramona man at the wheel of the Ford pickup was taken to the same hospital by ambulance. The highway was closed in both directions until about 3:30 Thursday morning. State Route 67 in the area of the crash is a curving, mountainous highway with one lane in each direction — though there are intermittent passing lanes on each side — and no divider between southbound and northbound lanes. Investigators did not know why the northbound pickup crossed into the southbound lanes but asked any witnesses to the crash to contact deputies at (858) 513-2800.